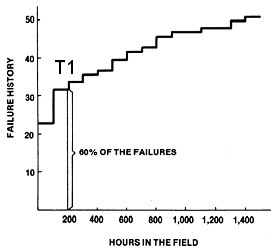 Studies have shown that 60% of all electronic component failures occur in the first 200 hours of operation (marked "T1" in the graphs). 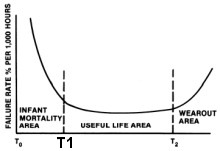 As time passes, the chance of failure declines until the components reach the wear-out phase (greater than 5 years for most solid-state electronic components). Component "burn-in" is when you run the equipment through the T1 period to reduce the risk of failure. Many PC builders use a 24-48 hour "burn-in". However, unless you do a 200 hour run, it does not qualify as a true burn-in by generally accepted Quality Assurance methods, and only a very small number of failures will be found. We perform several hours of testing to ensure that all components are working correctly. Desktop and Laptop Trading Computers, including all standard hardware and ordered software, are covered under all the below conditions for the length of the warranty purchased, as listed on the order invoice. Desktops purchased with longer warranties will receive coverage up to the duration listed on the order invoice. Monitors and Accessories are covered based on whether they were purchased with a Desktop or Laptop Trading Computer and the conditions of the warranty level selected upon purchase. See our Return Policy. Monitors stands are not covered under warranty. See our Return Policy. The Products we sell are designed and intended for rigorous use by professional, business, and commercial users. These computers are more sophisticated than household/consumer grade computers and may have different operating characteristics. We are not liable for loss of use as a result of shipping delays. Warranty coverage begins when the product is delivered. We are not responsible for loss of data as a result of equipment failure. It is highly recommended that you create backups of your system on a regular basis. A Surge Suppressor is required to be in place at all times while your computer is under warranty. Keep the box in which you received your computer. While under warranty, if the computer needs to come in to Falcon for repair, this box (and packaging material within) is required in order to protect the computer from shipping damage. A replacement box can be supplied but will only be sent via Ground shipping. International customers will be charged $120 (USD) for a replacement box. Damage caused by shipping will not be covered under the warranty unless the original box (and packing material) is used. The warranty does not cover damage due to wet, harsh, or corrosive environments (e.g. corrosion from salt in the air due to operation on or near the ocean). Damage from an electrical surge is not covered unless you bought a surge protector from us. Send it to us for a replacement exchange from the manufacturer if it is possible for us to do so. This may involve significant delays. If there is a problem, you will be called upon to perform various actions with our direction. You will be asked to perform recovery tasks and preliminary troubleshooting on your computer. These tasks, in some cases, may take a few hours to perform. YOUR COOPERATION IS REQUIRED AS A CONDITION OF ON-SITE WARRANTY SERVICE. If you do not wish to cooperate then you must ship the computer to us for repair. An important difference between our computers and household/consumer grade computers is compatibility with anti-virus software. Many anti-virus software packages are not designed or tested by their manufacturers for use on sophisticated computer systems and can significantly reduce the computer's performance. You do not have to buy anti-virus software from us, but if you use anti-virus software then you should use one that we recommend. If you request technical support that relates to software that does not operate correctly and you are using a non-recommended anti-virus program, that anti-virus program will need to be removed before support can proceed. If you purchased our virus and spyware protection and support service with your computer, and a virus escapes that protection, then we will do all that we reasonably can to remove viruses from your computer. Some viruses cause irreversible damage and no anti-virus software provides 100% protection. This service is not a 100% guarantee that all viruses can be removed or that the system can be returned to 100% of its original configuration after the virus is removed. Our virus and spyware protection and support service, if purchased with a computer, will provide remote assistance in removing a virus that has been detected but not removed by antivirus software or by you. If that is not successful then we will require the customer to send the hard drive to our facility for more advanced troubleshooting. Expedited shipping is not included in this service and is limited to two incidents per year per customer. Our Technical Support service, On-site technician service and replacement service does not cover reinstalling your self-installed software if the Operating System requires re-installation. If the Products are received damaged, we must be informed immediately. If the boxes are heavily damaged you can either refuse the delivery or inspect the computer for any signs of physical damage before signing. If there is no shipping damage, then you are responsible for the as-found condition of the computer when it arrives at your location. Our intake inspection is the only condition that will be valid in identifying damage. If the Product should have to be returned, it must be in the original packaging to avoid shipping damage. Poorly packaged Product returns are likely to be damaged, and the shipper may not accept responsibility for the damage. In such cases, the customer is responsible for Product damages (parts and labor). We reserve the right to negotiate alternative terms with individual customers based on individual circumstances. Such changes in agreements are only by mutual consent and are binding on all parties to the agreement. The first year that you own the computer, you get our awesome phone tech support included. After the first year you get two additional years of email tech support. This technical support only applies to a computer you bought from us. If email support determines that the problem is possible defective hardware covered by your hardware warranty then support will switch to phone support. The first two years that you own the computer, you get our awesome phone tech support included. Our technical support experts are second to none and far better than most. After the first two years you get an additional year of email tech support. This technical support only applies to a computer you bought from us. If email support determines that the problem is possible defective hardware covered by your hardware warranty then support will switch to phone support. The first three years that you own the computer, you get our awesome phone tech support included. Our technical support experts are second to none and far better than most. After the first three years you can continue to get technical support via email. This technical support only applies to a computer you bought from us. Support includes assistance getting you up and running during the first 3 months, allowing for most reasonable requests. During the entire warranty period we provide technical support for any hardware device or software that we sold you and can also provide advice and recommendations on other hardware and software issues (items that have been purchased from other vendors). Some limitations apply (i.e. printer related issues, third party device drivers, internet issues). You are expected to do only normal computer user tasks during troubleshooting. Other work is done through remote desktop connection or at our facility. We may provide phone assistance if you are out of warranty. We may limit assistance to 20 minutes or less, per incident. 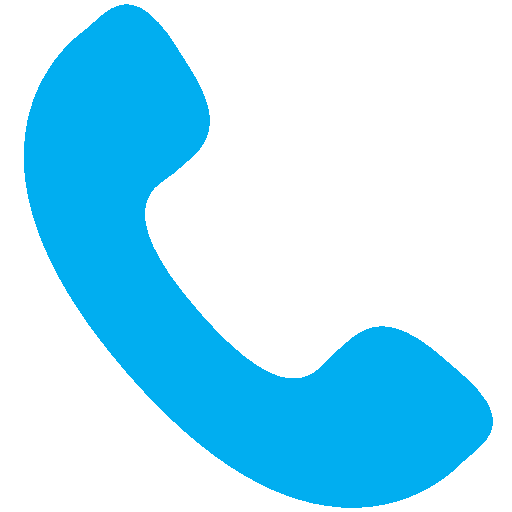 Out of Warranty calls will be answered based on the availability of our technical support staff. You get three years of free labor at Falcon's shop for any warranty covered repair. Non-warranty work will be billed at a reduced rate on a Falcon computers. You can even send in a computer to us for repair that we did not sell you but you pay our going rate, which is usually a lower rate than your average computer shop in a large city. Be sure to insure the computer you are sending in for repair. Falcon will not be responsible for damage to the computer caused by shipping. For 12 months, we will replace defective hardware with on-site labor using a technician in your area. We have access to over 13,000 technicians in USA and Canada. If an on-site technician cannot be found, or you live outside of North America, then you may take it to a local shop for up to $120 USD in labor charge compensation. Domestic customers may can send the computer to us for repair at our cost. The owner of this computer is entitled to 3 years of on-site labor, if it is available in his/her area. Most of the USA and major cities in Canada can receive on-site service. On-site service is not available in Mexico or outside of North America. In the first year that you own the computer the shipping both ways for warranty repairs is free (domestic customers only). After the first year you get two additional years where you pay to ship it to us and we cover the return shipping cost. Return shipping is only free if you get the green light from our tech support people to send it in. If you send it in without calling us and we do not find defective hardware that came with the computer from us, then you will need to pay for the return shipping. For a period of 1 year you get free parts replacement at Falcon's shop for warranty related component failures. For a period of 2 years you get free parts replacement at Falcon's shop for warranty related component failures. For a period of 3 years you get free parts replacement at Falcon's shop for warranty related component failures. Problems will be analyzed on the phone and may require your assistance. If there is a part that needs replaced, we will consider the situation to determine the best cost-equivalence to our domestic warranty. Some circumstances may require you to pay the difference in shipping or labor. If the part is small (i.e. video card, memory, solid state drive) and can be shipped at a low cost, and you can install the part yourself, we may pay for International shipping. If the part is large (i.e. motherboard, power supply), we may pay for International shipping if you will pay the labor charge for the installation at a local repair shop. We will provide instructions to a local repair shop for part replacement. Shipping to computer to Falcon is only considered in cases where the cause of the problem cannot be determined by remote diagnostics. The accidental damage repair insurance covers ground shipping both ways to repair your computer when it has been damaged by water or other liquids, smoke, lightning, drop, or accidentally breaking a USB/sound port on the front or back. On-site repair is not covered but if it is easy to fix we can send your the part and walk you through the replacement. The coverage lasts for 3 years. Accidental Damage coverage does not apply outside of North America. The original owner of the computer is entitled to technical support on his Falcon computer(s) as long as he/she owns them. If the computer is sold to someone else then technical support is available for 3 years from the date of original purchase. The original owner of a Falcon F-series computer is entitled to zero labor cost at the Falcon facility as long as he/she owns the computer. Other costs, like parts and shipping are not free. 2 years on-site labor in USA or Canada + 1 year mail-in (we pay ground shipping both ways). If the computer needs to be returned for repair then you can be expected to receive it back 2-3 weeks after you send it. You can pay to upgrade the shipping but that will cost you hundreds of dollars, even with our considerable discount at FedEx/UPS. Canadian customers should pick 3 years on-site as the customs system for you when shipping both ways is very important. Customs Canada will try to charge you with PST/GST on the return shipment until you prove it is being returned after repair. The owner of this computer is entitled to 3 years of on-site labor, if it is available in his/her area. Most of the USA and major cities in Canada can receive on-site service. On-site service is not available in Mexico or outside of North America. For a period of 3 years defective parts will be replaced by Falcon. This does not cover fire, flood, or physical damage due to impact with another object. It does not cover accidental damage to USB or speaker/microphone connections, or network connections. Replacement spare parts will be sent by 2nd day express. This warranty does not cover monitors, speakers, keyboard or mouse. Replacement spare parts will be sent by overnight express. This warranty will also cover monitors, speakers, keyboard or mouse if bought from Falcon for a period of 3 years. The accidental damage repair insurance covers ground shipping both ways to repair your computer when it has been damaged by water or other liquids, smoke, lightening, drop, or accidentally breaking a USB/sound port on the front or back. On-site repair is not covered but if it is easy to fix we can send your the part and walk you through the replacement. The coverage lasts for 3 years. The original owner of a Falcon computer is entitled to zero labor cost at the Falcon facility as long as he/she owns the computer. Other costs, like parts and shipping are not free. In the first two years that you own the computer the shipping both ways for warranty repairs is free (domestic customers only). After the first two years you get an additional year where you pay to ship it to us and we cover the return shipping cost. Return shipping is only free if you get the green light from our tech support people to send it in. If you send it in without calling us and we do not find defective hardware that came with the computer from us, then you will need to pay for the return shipping. In the first three years that you own the computer the shipping both ways for warranty repairs is free (domestic customers only). Return shipping is only free if you get the green light from our tech support people to send it in. If you send it in without calling us and we do not find defective hardware that came with the computer from us, then you will need to pay for the return shipping. Canadian customers should check with local repair shops for laptop support as the customs system for you when shipping both ways is very important. Customs Canada will try to charge you with PST/GST on the return shipment until you prove it is being returned after repair. Parts can be shipped to you as long as there is someone there to do the labor. In the first three years that you own the computer the shipping both ways for warranty repairs is Overnight and free (domestic customers only). Return shipping is only free if you get the green light from our tech support people to send it in. If you send it in without calling us and we do not find defective hardware that came with the computer from us, then you will need to pay for the return shipping. Our laptops are purchased from a chassis manufacturer that provides a warranty for parts that we cannot install at our facility. These parts include the chassis itself, the battery, the motherboard, the CPU, the LCD screen, and other smaller components built into the chassis. If your laptop requires repair that cannot be performed locally, or at Falcon, the laptop will need to be shipped to the chassis manufacturer. All support issues will be handled by us, and we will act as intermediary between you and the chassis manufacturer in cases where the laptop needs to be sent to them for repair. We cannot replace these parts ourselves due to the conditions of the warranty with the chassis manufacturer. We can, however, arrange for the laptop to be sent directly from you to the chassis manufacturer. YOU MUST MAKE ARRANGEMENTS WITH US BEFORE SENDING IN YOUR LAPTOP. Please provide updated shipping information to ensure quick returns. Prior to returning any Product you must obtain approval from us. The return period starts on the day you accept delivery of your original item. If the item was repaired or replaced for any reason, the return period is not reset unless it was damaged in shipping or other arrangements are agreed upon. Do not ship it back to us without contacting us first. You pay to ship it back to us and MUST PROPERLY PACKAGE AND INSURE IT. If it is damaged during shipping, then you must get compensation from the carrier. We will cooperate with your claim processing as much as possible. You will not be refunded for items that cannot be resold due to damage or are missing accessories or documentation. No refund for special order parts that you requested for your computer. If the exterior of a computer or monitor stand is scratched or damaged then you will be charged for the cost of repairing it. Monitors and Accessories purchased without a computer are returnable as long as the packaging has not been opened (shipping costs not included in refund). Do not items it back to us without contacting us first. Returns of Monitors will not be accepted if they are damaged, lack their original box, or lack their original packaging material. Returns of Accessories will not be accepted, they are yours once you begin using them. Stands are returnable as long as the packaging has not been opened (shipping costs not included in refund). Do not ship items back to us without contacting us first. If the exterior of a monitor stand is scratched or damaged then you will be charged for the cost of repairing it. This fee will be waived if you paid for shipping (i.e. you didn't get free shipping or you shipped it under your own account). If the box(s) are unopened then there will be no restocking fee. Otherwise, there will be an inspection/restocking fee of 10%-25% depending on the condition of the returned items. Items being returned due to a customer caused defect, like a virus or damage to a USB port, will be charged a restocking fee of at least 10%. If the exterior of a computer or monitor stand is scratched or damaged then you will be charged for the cost of repairing it (monitors cannot be returned with scratches or damage). 5% Inspection and restocking fee applies to Laptops still in new condition. Laptops returned that are not in new condition will be credited the market value (our assessed value) based on the condition. 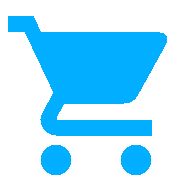 10% Inspection and restocking fee applies to other items. We will not accept delivery of items that were shipped after the return policy expires. If our loading dock crew inadvertently accepts the item then it will be held for you until you have the item picked up at your expense. A defective computer is one that does not operate the way it was designed to operate. If the computer was ordered with an Operating System or Software, problems with the programming code of the Operating System or any Software installed does not constitute a defect in our product. If the customer finds some aspects of the computer undesirable, but it is a normal condition, that does not constitute a defect. Lack of compatibility with some peripherals does not constitute a defect. You pay to return the computer to us for a refund.